Friday April 12, 2019-Former Jubilee party Vice Chair, David Murathe, has revealed that Deputy President William Ruto is on his way out of Jubilee Party and warned President Uhuru Kenyatta to be careful around him going forward. According to Murathe, Ruto is out to frustrate Uhuru and then bolt out to form a party similar to defunct URP. Speaking on KTN, Murathe said the recent appearance of Ruto's allies in Yellow T-shirts is an indication that his stay in Jubilee party is limited. He said he is reintroducing URP. 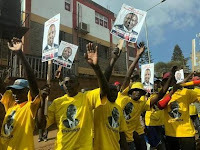 “You have seen they have started wearing yellow T-shirts, which are colours of URP. What message are they sending? Are they hinting at leaving Jubilee?” wondered Murathe. However, Ruto has maintained that he is not leaving the Jubilee Party just yet, arguing that he will contest presidency on a Jubilee Party ticket come 2022. "Let's cross the bridge when we reach there. I will first contest in the Jubilee party primaries. If I get the ticket, I will use it to run for Presidency. Hopefully the contest will be free and fair," he said. Ruto's allies led by Nandi Senator Samson Cherargei have in the past hinted that the DP could ditch Jubilee for an outfit formed by himself to avoid being shortchanged in Jubilee party.